Welcome to the JNHT Tour Sites; a stimulating insight into some of the county's unique historic landmarks and other famous heritage sites which offers both guided and unguided tours. Jamaica is enhanced by a rich ancient heritage going back over 300 years. Including such historic places as the Rio Nuevo battle site, Rose Hall Great House, and Port Royal/Port Charles which attracts thousands of tourists every year. Here are links to information on places of interest, relative to Jamaica's heritage. Blenheim - Hanover - birthplace of Sir Alexander Bustamante, first prime minister of Jamaica. Roxborough - Manchester - birthplace of National Hero, the Right Excellent Norman Washington. Seville Heritage Park - St. Ann - historic Seville Estate, is the Seville Great House (Plantation House) & Heritage Park. Rio Nuevo Battle Site - St. Mary - site of the final pitched battle between British and Spanish forces to determine possession of Jamaica. Mountain River Cave - St. Catherine - Mountain River Cave located in the lush green terrains of Cudjoe Hill, St. Catherine where there is a large collection of Taino art. Historic Spanish Town Square - St. Catherine - Spanish Town, built by the Spanish after Sevilla Nueva (New Seville) was abandoned, dates from 1534. 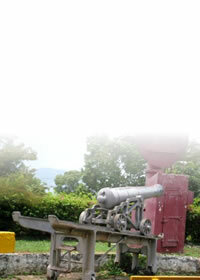 Port Royal & Fort Charles - Kingston - The first fort to be erected in Port Royal was Fort Charles. 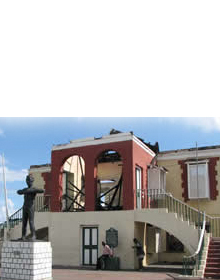 National Heroes Park - Kingston -The area on which the National Heroes Park now stands was once one of the most popular spots in Kingston. Liberty Hall - Kingston - Liberty Hall located at 76 King Street, Kingston was the centre of activities for the Kingston division of The U.N.I.A. Accompong - St. Elizabeth - The town was founded in 1739 when land was given to the Maroons as part of a Peace Treaty with the British. Bob Marley Museum - St. Andrew - The former residence of the Hon. Robert Nesta Marley. Brimmer Hall Great House - St.Mary -Built during the 18th Century by the plantocracy during the days of slavery. Bustamante Museum - St. Andrew - The former residence of the late Sir Alexander Bustamante. Devon House - St.Andrew - a fine example of nineteenth (19th) century domestic architecture in Jamaica. Firefly House - St.Mary - Home of British Playwright Noel Coward. It was originally called "Look Out" by the famous pirate Henry Morgan since it had been used for that purpose. Greenwood Great House - St. James - The Barretts of Wimpole Street fame came to Jamaica in the 1660s and amassed great wealth from their sugar plantations.They built Greenwood great house. Hollywell National Park - St. Andrew - The forest Park is a sanctuary for several species of birds, ferns, flowers, and trees which are rarely seen in other parts of the island. 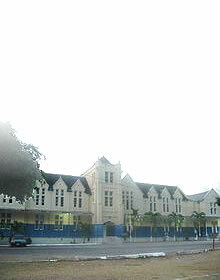 Institute of Jamaica - Kingston - Established in 1879 during the governorship of Sir Anthony Musgrave, for the encouragement of Literature, Science and Art. Lovers' Leap - St. Elizabeth - A cliff with a drop of approximately 1,600 feet. The legend associated with the site is that two slave lovers hand in hand plunged to their death. Rose Hall Great House - St. James - With the many stories about its former owner, Annie Palmer and the cruelty she meted out to her slaves, Rose Hall Great House is a very popular visitor attraction. Two Sisters Cave - St. Catherine - Each cave has a large sink hole, which contains fresh water. It is possible that these reservoirs served as sources of fresh water for the Tainos. Trench Town Culture Yard - Kingston - The Trench Town Culture Yard is one of the many houses which was built by the Central Housing Authority between 1940 & 1949.